I'm back in Dhaka (Bangladesh), five weeks after my last visit in July, to help facilitate the first ever online election of executive officers for the Bangladesh Midwifery Society which is twinned with the Royal College of Midwives. 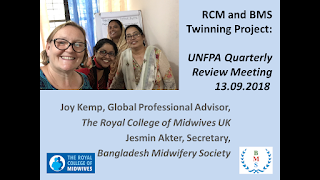 I am the Project Leader for this twinning project which builds on the RCM's previous twinning work with midwives associations in Cambodia, Uganda and Nepal. The government of Bangladesh is to be congratulated on its commitment to midwifery, a new profession here. The first ever international-standard midwives were deployed into government service on 1st July and midwifery education only started in 2013. The governments of the UK, Sweden and Canada are funding a national strengthening midwifery programme through the Ministry of Health and Family Welfare and coordinated by UNFPA. Our twinning project is a part of this, aiming to develop midwife leaders to advance the profession. The International Confederation of Midwives suggests that midwifery has three 'pillars' - education, regulation and professional association. So our work is vital to develop a strong midwifery profession. Other implementing partners in the Strengthening Midwifery programme include Save the Children, the Obstetric and Gynaecological Society of Bangladesh, UCEP and Dalarna University. Through these organisations midwife teachers are being supported and developed, newly qualified midwives are being mentored, and health facilities are being upgraded along with skills and language labs and academic libraries. The scale and scope of the programme is impressive and this afternoon we were all called to a meeting to update each other and high-ranking ministry officials on progress towards our objectives. Jesmin and I felt relaxed presenting together, having honed our presentation skills in Dubai last week at the International Confederation of Midwives Regional Conference for Asia. The conference was a wonderful opportunity, not only to present our twinning work from Bangladesh but also to catch up with twinned partners from Nepal and Cambodia and the wider ICM community. We were honoured with a visit from Princess Muna al-Hussein, a global ambassador for nursing and midwifery. I was also delighted to have the company of my daughter Hannah (19) in Dubai. I've been away from home for almost 3 months with travel to Bangladesh and Uganda, so it was great to catch up, sharing a room and experiencing the sights of Dubai together. We watched a movie in the cinema and wandered around shopping malls, things we never get a chance to do in the UK. Once the elections are over in Bangladesh, we will be focusing on supporting the new executive committee, whilst honouring the contributions of the outgoing executive and ensure a smooth handover. We will be evaluating the first phase of the project during the next quarter and planning for a further three years of partnership. We are also interviewing for a new RCM Global Projects Officer, to be other half of my team, on the day after I return from Bangladesh so hopefully I can fight the jet-lag and stay awake for the duration of the interviews! 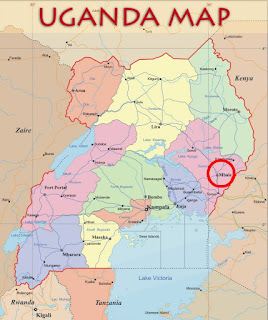 I'm in Uganda for a month, helping to mentor some midwives who are leading palliative care services in Mbale (Eastern Uganda, near the Kenyan border) and furthering the RCM's twinning partnership with the Uganda Private Midwives Association. 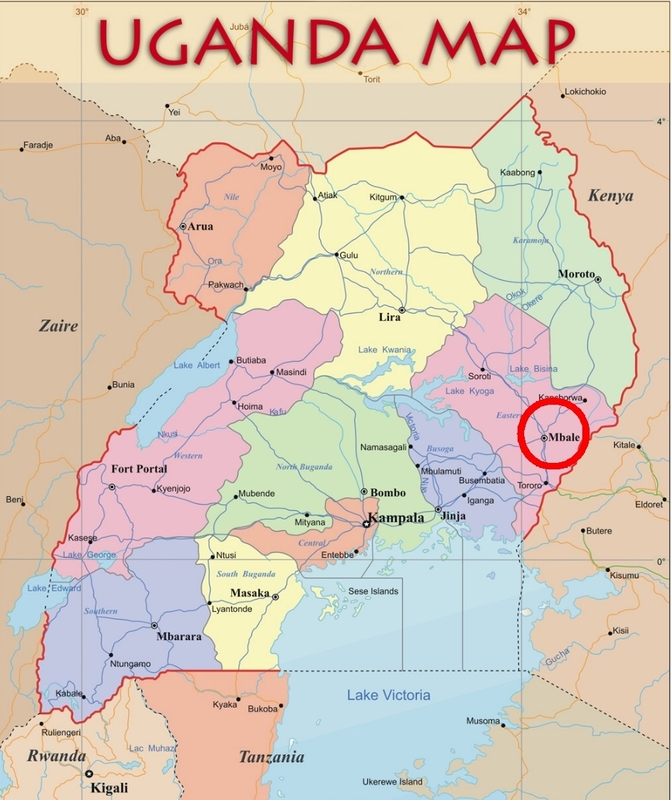 I'm currently up-county in Mbale - 6 hours away from Kampala - seeing where my mentees work and getting a flavour of the challenges they face on a daily basis. Today we went out on a field visit to a remote district reachable only on a bumpy dirt road - to see Esther in action mentoring health professionals she had previously trained in palliative care. On arrival we were told by the Nurse-in Charge that unfortunately one of their nurses was gravely ill with eclampsia and an ante-partum haemorrhage. The nurse, 7 months pregnant, was found to have proteinurea last week and had been placed on sick leave. Today, she arrived at the hospital in the morning with seizures and vaginal bleeding. They sited an IV with difficulty and gave magnesium sulphate but were unable to perform a Caesarean Section (despite having an operating theatre) because the only doctor was absent. She was therefore transferred to Mbale, an hour away on that bumpy road. The hospital has an ambulance but it had no fuel, so they had to find other transport - not easy in the middle of nowhere. On reaching the Regional Referral Hospital she experienced a further delay, joining a queue of women waiting for life-saving surgery. We heard later that the baby was stillborn and the mother died within half an hour of finally accessing a caesarean section. She leaves two other small children and a grieving husband and father. We then visited the labour ward at the district hospital. Four staff were supposedly on duty but only two were insitu, both very junior. A woman was in labour with her 5th baby, naked with no privacy, constrained to the bed and lying flat. She had received no fluid or food for over 6 hours and was not being monitored in any way. Her contractions had fizzled out, unsurprisingly. We encouraged the staff to mobilise her, feed her, offer comfort and respectful care. We phoned throughout the day to see how she was doing - eventually we heard that she too had been referred to the regional referral hospital. Those staff did not have the skills, support or infrastructure to provide quality maternity care, a problem sadly all to common across Uganda. Despite the presence of several sinks and taps, there was no access to water - running or otherwise - on the labour ward. This is why the mentorship programme the RCM developed with its partners from 2015-2017 is so vital, allowing midwives to qualify having had good quality learning experiences and effective mentorship as students. Unfortunately this hospital had no such intervention. I weep for the woman and baby who lost their lives, for the children left motherless, for the women who missed out on receiving high quality care and for the midwives who experience poor quality training and little support. We hope, through our long term twinning project, to be able to make a difference. 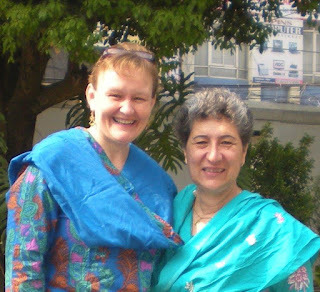 The RCM has been engaged in midwifery twinning in various countries since 2012 but only started the Bangladesh Twinning Project in July 2017. 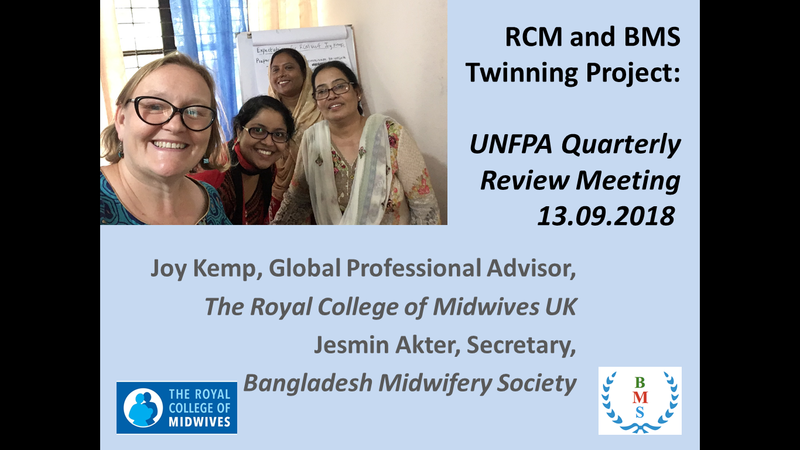 Twinning is reciprocal so as we hope to help strengthen the Bangladesh Midwifery Society (BMS), we also hope to bring learning and new ideas back to midwifery in the UK. It’s a crucial time in the project, nearing the end of our first year – which has seen many successes and challenges – and helping to prepare for an election for their executive board members, voting for which will be fully electronic for the first time. New members are frantically enrolling so that they can be eligible to stand for the board, or to vote for their preferred candidates. With our help, BMS have hired 6 student midwives to help with data entry and 40-50 new members are joining every day – I’m sure the RCM would love to match that! I’m here in country for a week to support the preparation, meeting with the Election Commissioners who are overseeing the process and supporting the (one) staff member and outgoing executive officers, plus meeting key stakeholders. This involves lots of cups of tea and biscuits so not good for my waistline! Travelling on my own this time, I’m staying in a safe hotel near the Diplomatic section of the city. I’m using the time to make phone calls and cat-nap to counter the jet-lag.This requires long Uber journeys across the congested and polluted city of Dhaka to get anywhere. Tomorrow I may take my Kindle! Yesterday a Bangladeshi colleague asked me how I spend my evenings in the hotel. She was worried I would be bored or lonely. In fact, the evenings fly by as I have to keep up with e mails, expenses, writing up notes and preparing presentations in addition to video calls with family, blogs, social media – and often evening meetings over dinner. I’m lucky to have a couple of long-term friends in Dhaka (though both happen to be away this week) so on other trips I’ve spent time with them too.